According to Madagascar herp expert Mark Scherz (private communication), this species is really a species complex, which will hopefully be worked out in a few years. The Reptile Database also helpfully points out that this is a diurnal species, despite the phrase "night snake" that sometimes pops up in its common names. One of the crown jewels of the dry forest of the Anjajavy reserve is a fossilized giant lemur skull in a cave. We joined a group of Anjajavy guests in a late afternoon hike to view this famous skull. To reach it, we first had to climb down into the front part of the cave, where it's still light, via a makeshift ten-foot ladder. Then we took turns to carefully squeeze through narrow limestone passages with flashlights in the dark to reach the skull itself. 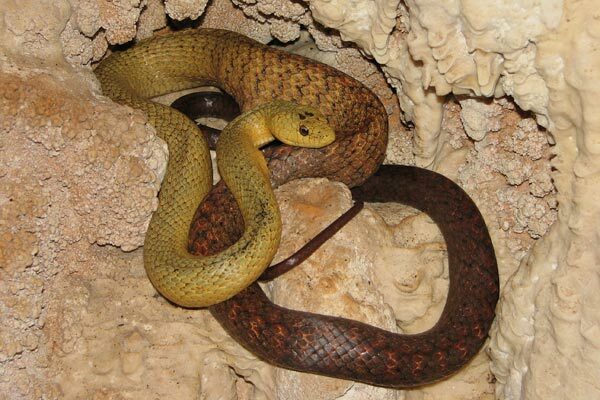 This marvelous snake was perched as shown here between the light part of the cave and the lemur skull, digesting some huge meal. Its presence dissuaded some of the guests from reaching their skeletal goal. My wife Monica Rua took this photograph. Thanks to Mark Scherz for consulting with Frank Glaw and associates about the identify of this snake.